After having played competitive volleyball for nearly 30 years, Pam Bishop, 59, was ready for a change. She still enjoyed playing, but had torn her rotator cuff and had trouble with her knees. “They sounded like Rice Krispies whenever I went up the stairs,” Bishop said. At six feet tall, she has also suffered from scoliosis. When she quit volleyball and discovered ballroom dance about 10 years ago, her health began to improve. She has lost over 20 pounds and says she feels like she is in better shape than ever. Now she dances several nights a week, her knee pain has gone away, and because of the emphasis on her frame and body position, her posture has improved. “My doctor tells me I need to keep doing this as long as I can,” Bishop said. Like any physical exercise, dance offers the benefits of increased bone density — thus enabling older adults to fight off osteoporosis — increased flexibility, increased calorie burn, and lowered blood pressure and cholesterol. The emphasis on good posture helps strengthen the core and improve balance to prevent falls. Dancing has also been associated with a lower risk of dementia, according to a 2003 study published in the New England Journal of Medicine. A 2017 study in Frontiers in Human Neuroscience also found that dance offered cognitive stimulation and induced changes in the hippocampus, the center of emotion and memory. A study from 2016 in the same journal found that ballroom and other social dance help improve spatial memory. Another great benefit of ballroom? It provides opportunities to enhance social interaction, which correlates with good health in general. There are many opportunities to participate in ballroom dance at studios throughout the Richmond area, including Rigby’s Jig, Simply Ballroom, Fred Astaire, Dance Masters and West End Latin and Ballroom. In addition to studios, there are opportunities for ballroom and Latin dancing at restaurants, breweries and even the VMFA. Richmond also has a chapter of USA Dance — an organization that promotes the social and competitive aspects of ballroom dance and holds events on the first and third Saturdays of each month. Bishop enjoys ballroom for more than just the health benefits. After taking lessons with Simply Ballroom, she decided to pursue teacher training. Now she offers private lessons a few nights a week in Ashland. Helping students feel less shy on the dancefloor has been incredibly rewarding. In addition to teaching and taking classes, Bishop trains for competitions — at least 15 so far. While she loves to train and perfect her technique, she admits that the glamour of the competition scene also appeals to her. “Half the fun of doing this is getting to dress up like Cinderella,” she laughed. Beth Gordon, 59, started taking ballroom lessons at Rigby’s Jig four years ago when she was looking for something to do following her divorce. Dance opened up many opportunities for her to meet people and get more involved in the community. Now, in addition to taking classes, Gordon teaches at the studio — primarily couples learning dances for their weddings. A self-described night owl, Gordon dances most nights of the week, either participating in classes at the studio or dancing with friends at live music venues. She also participates in USA Dance workshops and travels for special workshops. Although Gordon enjoys all styles of dance, she has found her passion in the contemporary music and high energy of the West Coast Swing, and has participated in events in both Charlottesville and Washington, D.C.
Gordon loves that she can interact with so many people through her newfound passion. “I learn something from every new person I dance with,” she said. Bill and Helga Gallahan discovered ballroom dance over 15 years ago. Helga, 68, had taken line dance classes in the Northern Neck, where they used to live, but struggled with knee pain. After she had a partial-knee replacement, her surgeon recommended she switch from line dance to ballroom dance because it would put less strain on her knee. 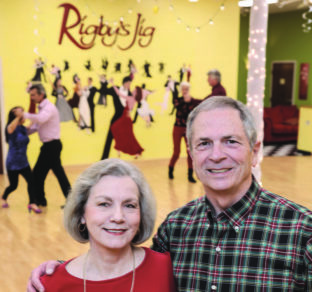 She and Bill, 76, began commuting to Fredericksburg for classes and then, when they moved to Richmond six years ago, they started taking classes at Rigby’s Jig. They now take classes several nights a week and participate in the studio’s performance group, which involves learning a special routine and performing it at various area venues. Both Bill and Helga like that they can pick up on steps relatively quickly yet always have more to learn. “Ballroom is easy to learn and hard to master,” said Bill. “So, you can come in and enjoy it right off.” The learning never stops, though, so they still take classes a couple of nights a week and regularly participate in USA Dance workshops. They enjoy dancing together and having to communicate with each other through non-verbal ways. But they also find it interesting to dance with other partners at the many events they attend. For the Gallahans, ballroom has provided a great option for physical and mental exercise. But it has also provided opportunities for them to build a social network in Richmond. “The ballroom community is welcome to and supportive of everybody,” Bill said. Keith and Sandra Mawyer, both 63, started off their dance journey almost a decade ago taking classes in shag, a dance style that took root in beach towns in the South. They had always enjoyed shag, but when a friend gave them free passes for Simply Ballroom several years ago, they were hooked. The Mawyers now attend classes at the studio often, sometimes even five nights a week, and participate in a teacher training program. Dance has provided the Mawyers with a chance to push themselves physically and mentally as they continue to improve and learn more. At the same time, it has helped them develop important social connections. “All of us at the studio have gotten to be such good friends,” Sandra said. Their group of friends takes classes and participates in social dances on Friday nights at Simply Ballroom and on Sunday nights at Dance Space. Tom and LaDonne Baron decided to take ballroom dances lessons at Simply Ballroom after watching Shall We Dance — the 2004 ballroom dance movie starring Richard Gere and Jennifer Lopez — several years ago. They are quick studies. Since then, LaDonne has competed three times and performed in four showcases, and Tom has performed in a showcase and will be performing in another one soon. 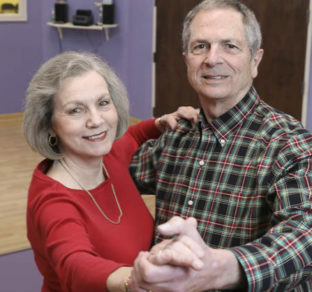 While both Tom, 85, and LaDonne, 75, love ballroom dance, they enjoy it in different ways. LaDonne, for instance, tends to be a more serious, technical dancer, and she loves to compete. She has earned high scores for her competition performances. She recently moved up from the bronze to silver level and, for the first time ever will be wearing a custom-made gown for her upcoming competition. LaDonne has always loved clothing and shoes, so she enjoys having the opportunity to dress up. Tom is unable to compete because an old leg injury prevents him from being able to perform some of the steps required at the competition level. He has a great sense of humor, though, and thoroughly enjoys performing. “He brings the house down,” LaDonne said. “He is such a ham.” When he participates in ballroom, Tom emphasizes the fun of it. The Barons take as many group classes as possible to perfect their technique, as well as private lessons to work on competition and showcase dances with their respective partners. They also enjoy participating in social dances. That means they are at the Simply Ballroom studio five, six, even seven days a week, often for a couple of hours at a time. They both admit that they’re busier now than they have ever been. In addition to all the time they spend in dance lessons, they participate in the Richmond Parkinson’s Dance Project and like to get together outside the studio with close friends they have made through ballroom.